Most folks have been regaled with stories of the fabulous Argentina shotgun endurance test, a test so rigorous and brutal that no new model of shotgun has ever failed it in recorded history. But will it “hold up in Argentina?” is a common story line. Well, things are not always what they seem. There is hardly a grand difference between warm weather, high volume, light load shooting in Argentina and the same situation elsewhere in the world. Rental guns in the United States see just as severe of a duty cycle and sometimes under hotter and dustier conditions. Have you been to Las Vegas in August? The first trip to Argentina years ago found me bringing along two autoloading shotguns, both Browning B-80 12 gauges, one with a steel receiver and one with an alloy receiver. It was the “Boy Scout's Motto,” for just in case there was a problem with B-80 #1, I was good to go on the second. As it worked out, the second B-80, the one with an alloy receiver, was never fired in South America. There were no failures or parts breakage and I still own and shoot that specific steel receiver B-80 today. My late father was worried about the recoil, but loved shooting A-5s and also liked his then-new Browning Gold 20 gauge for doves and pheasants. I found a like-new Belgium A-5 Light Twelve after an elk-hunting trip in Montana, so we bought it. It had a cut-down buttstock, which fit the bill well as we added a massive Pachmayr “Triple X” pad to it. Although Dad's Gold worked perfectly, the A-5 had a problem. One morning, Dad shot some one hundred and eleven ducks with his A-5. Somewhere along the way, Dad shot the bead off of his A-5. Dad was a bit grumpy, for he felt that very early in the morning he would have dropped at least another dozen ducks if he had a better idea where the end of his muzzle was in the misty early-morning twilight. I was particularly unsympathetic, for I asked Dad if he told his buddies back home that he only bagged 100 ducks in a brief morning, if anyone would feel that was a brutally hellish experience for him? I got a puff of cigar smoke in my face as a response, the A-5's bead was replaced, and the rest of the trip continued without incident. That A-5 still functions perfectly today, now wearing a standard buttstock. As for the Browning Gold 20, Dad shot it for the rest of his life. Yes, it eventually “broke” after patterning some 1-1/2 oz. 20 gauge turkey loads. It was the old bolt buffer that sheared apart. I replaced it in a few minutes and that was that. Now, certainly there is nothing wrong with spending a week in Argentina, quite the contrary, and like all rental gun scenarios it does give an idea of high round count durability. But, there is also a lot of things that the celebrated “Argentina Test” does not and cannot show. High-volume wing-shooting in Argentina as we did in Entre Rios Province says nothing about cold weather performance, 3 inch unfolded length shotshell function, much less 3-1/2 inch shotshell function, or function with steel shotshells. We shot 1-1/8 oz. lead loads at everything, #7-1/2 shot for doves, #5 for ducks, and that was essentially it. Dad's Gold 20 got 7/8 oz. loads for dove: that was all that was available. No one is shooting steel, 3 inch loads, much less 3-1/2 inch loads. If lead was allowed in all areas, neither would we. The number of shotguns that go bang in the United States every day dwarfs the rest of the world, just like it does in every category of firearms. You might be surprised (I was) to learn that the entire “Beretta Group” (Stoeger, Sako, Benelli, Beretta, Franchi, Uberti, etc. ), according to Beretta, has 60% of its entire world-wide sales in the United States. That percentage is dramatically higher for the best-selling American shotgun brands such as Mossberg and Remington. Most of the guns that go bang in Argentina for doves today are 20 gauge autoloaders, and most of them wear Beretta or Benelli nameplates. You cannot rationally compare 20 gauge autoloaders firing 7/8 oz. loads to 12 gauges. We like to assume that because we think a shotgun is a “good” gun in 12 gauge, it just has to be as good in 20 gauge. Well, maybe, but maybe not. It is different tooling and parts, so a particular 20 gauge may well be similar in durability to its 12 gauge counterpart, but it may also be a lot better or a lot worse. While the daily round counts of 1000 shots or more are impressive, those are mostly the same low intensity 7/8 oz. 2-3/4 inch shells. There is naturally far less shock, vibration, and stress to the action from the light target variety of shell than the American Magnumitis genre of load. There are shotguns like that, to be sure. With target loads, perhaps never a problem, but that very first turkey load sometimes bends a mainspring tube and, as a bonus, the charging handle from the breechblock goes flying. The charges for rental guns varies in Argentina, but can be $70 a day or so in 2016. A shotgun doesn't have to function for very many days before it has paid for itself. A gun that holds together for forty-five days of use brought in over $3100 and that buys a lot of extractors, springs, and shell elevators. This does not totally invalidate the “Argentina Conditions” but at the same time, Argentina conditions are not the North American Canada Goose conditions, either. Despite some 3.5 million geese taken every year, both the migratory and resident, or non-migratory goose population continues to skyrocket, now hitting 6,000,000 geese by some estimates. The Argentina dove load does not reasonably compare to the steel Canada goose load. Presumably, more than 3.5 million goose loads were fired to take 3.5 million geese. Comparing a dove to a goose to a turkey does not make perfect sense, nor does the comparison of the shotguns used to bag them always make brilliantly perfect sense, either. You can easily spend $4500 today for a three day dove hunt in Argentina. You can also buy nine Weatherby SA-08 20 gauge autoloaders (or other makes and models) for that and have cash left over. If you go high end, like Los Chanares in Cordoba during sunflower season, dove shooting is $790 per day, $75 gun rental per day, $65 hunting license per day, making the standard three-day shoot $2790 not counting gratuities or ammo. Ammo is $13.75 per box of 25. If you shoot 3600 rounds, you just spent another $1980. Call it $5000 and with airfare, well, by the time you are back home somehow you have likely invested $7000. For the record, apparently the record was 14,250 shells fired through seven Beretta 20 gauges by Todd White in one day: four O/U's and three 391's for 11,301 doves dropped over 14 hours. 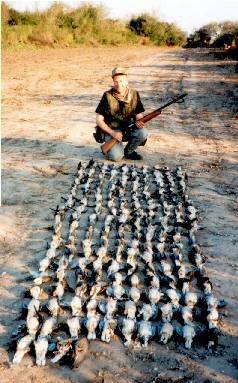 That was January 30, 2010, but later that year Scott Breeze set the world record by shooting 15,208 doves in one day with 16,575 shots in Argentina on Nov. 7, 2010. Scott Breeze used four Winchester SX3 20 gauges. Several of the top dove hunting concerns are affiliated with the “Beretta Trident Program,” so it is totally unsurprising that Beretta shotguns are used. Those with inquiring minds would like to know why it took seven Beretta 20 gauges to make it through the day, and why it took four Winchester SX3 shotguns to make it on the other attempt. Lacking that, the result looks like more or less just another marketing stunt. The reason it appears to be a marketing stunt is only because that is exactly what it is. Although a well-known method of attempting to advertise shotgun reliability, the “Most Excellent Argentina Adventure” test doesn't mean much, either way. It would be far more meaningful if the competitive shotguns of interest just went to the desert, then were fired until something jams or breaks, with the results carefully and honestly documented. That type of comparative testing is so very obvious that no manufacturer bothers to conduct it.